It is hard to believe this will be my last post in 2014. Wow! I will end it on a warm note. Jim and I went to Couples Negril in Jamaica a couple of weeks ago as a belated anniversary celebration. You certainly do not want to be there in August anyway. We last visited this all-inclusive resort 11 years ago for our 25th anniversary. As a surprise to Jim, I had arranged a ceremony to renew our vows. It is still one of the highlights of our marriage. This resort consistently gets 4-5 star reviews on Tripadvisor, my go-to site for checking hotels, things to do and see, and restaurants when I am traveling. Our first visit got high praise from us. The staff was warm and welcoming, always greeting us and making sure there was nothing that we needed. The food was very good, and the included activities were exceptional. 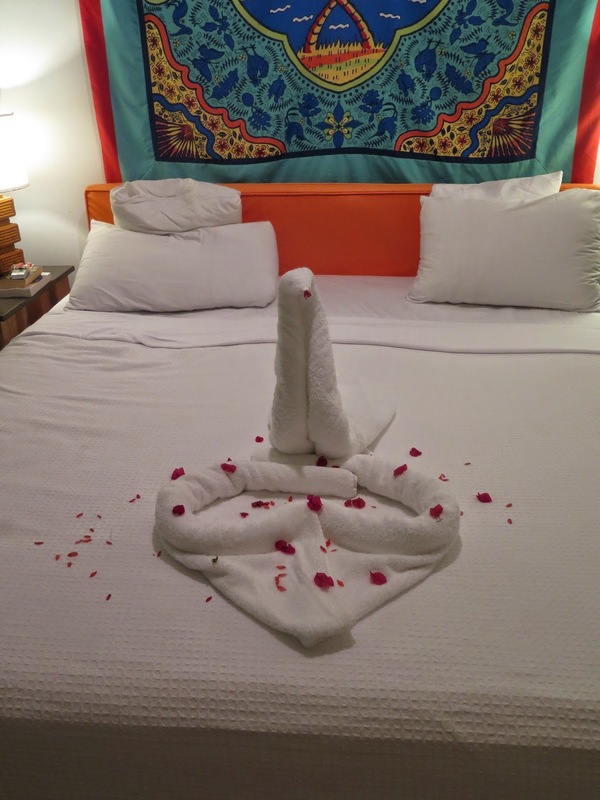 In fact, this is the only resort we have every stayed at where you can scuba dive, snorkel, go out on glass bottom boat rides and sunset catamaran cruises, water ski, play tennis and golf as much as you like at no additional charge. And that doesn't even take into account things like kayaking, small catamaran sailing, volleyball, horseshoes, pool, ping pong, etc. Upon our return the first time, I gave the resort a 5 star rating. Since that visit they have done a little upgrading of the rooms, free wifi is everywhere on the grounds, all the activities are still offered and the beach still cannot be beat. But we found a big difference in the attitude of the staff. Service was poor in some cases, and several staff members seemed to wish they were elsewhere. There was a problem with our initial room, and the front desk gal was not sympathetic nor did she seem inclined to let us change rooms. For that reason, they have slipped to a 4 star resort in my book. Having said that, we had a wonderful time, met some fun people from Holland, the United States and Canada, and spent a restful week on the beach. Taking a week off that close to Christmas might not have been the best idea we ever had, but everything got done in the end. No problem, mon. Soulard Art Market & Contemporary Gallery is, as you might imagine, located in the Soulard district of St. Louis. 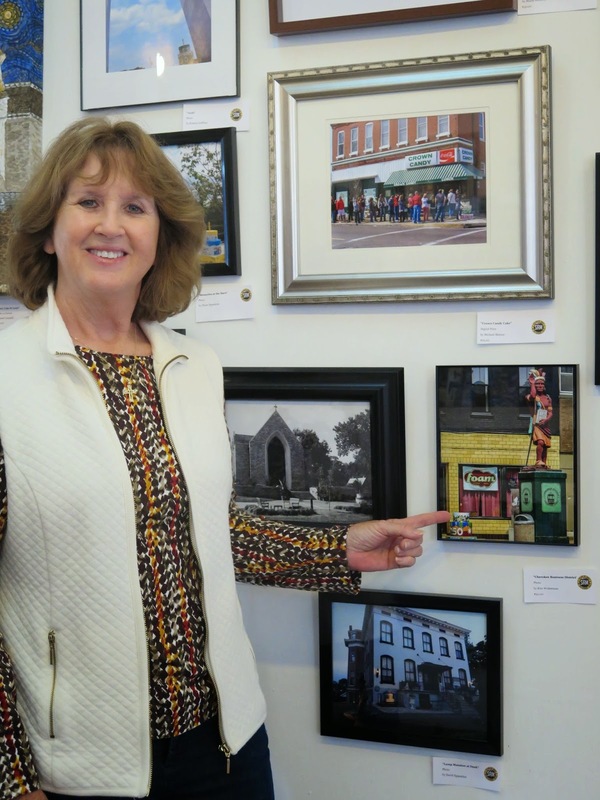 A variety of local artists display their work here in media ranging from jewelry, painting, photography and sculpture. The gallery holds exhibits displaying the works of local artists. 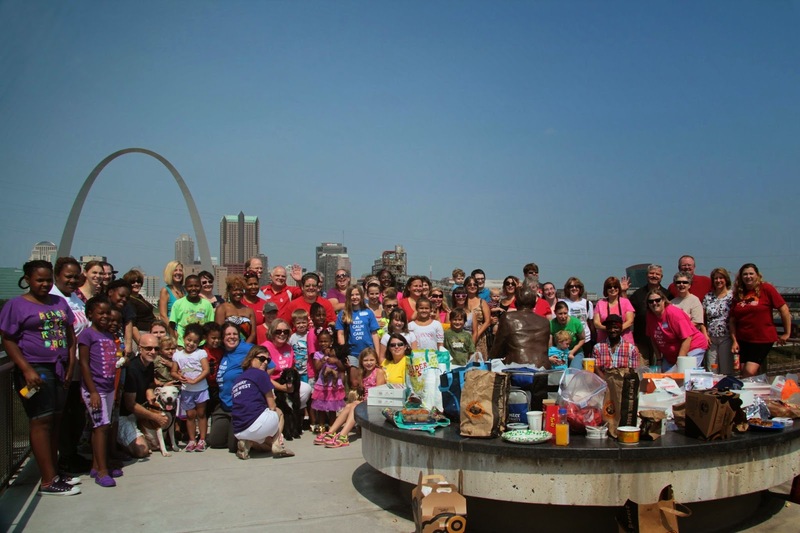 The current exhibit is "Everywhere There's Cake", celebrating the 250th birthday of St. Louis. Artists were invited to submit up to three works in which one of the 250 + cakes was shown with a local landmark. However, they wanted the cake to be small, showcasing instead the St. Louis area landmark. The art could be a photograph, painting or mixed media work. 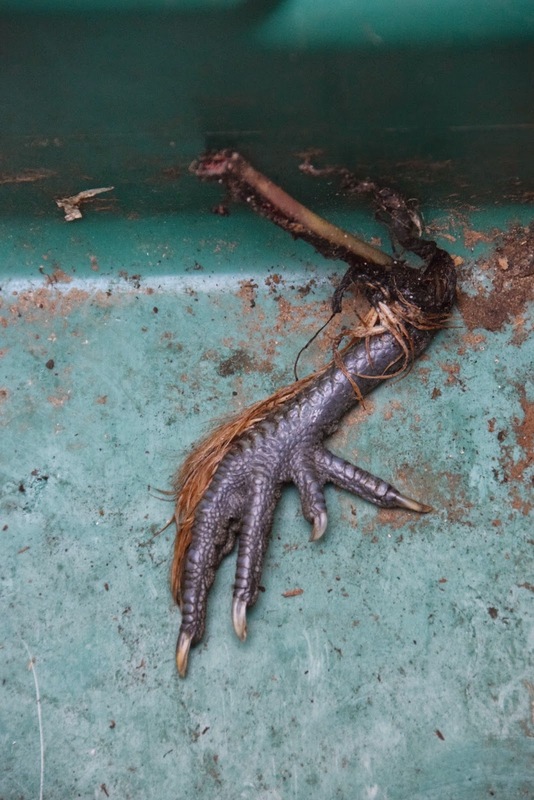 Of course I knew I had to submit some photos, and I am proud that all three of my submissions were accepted. An opening reception was held last Friday, but I was out of town and unable to attend. Jim and I went instead on Sunday. Believe it or not, one last cake is being painted at the art market, and I was lucky enough to catch five of the cake artists putting their mark on this final (?) cake. The exhibit itself is quite amazing. There are a few paintings and one three dimensional piece made out of stained glass, but most of the submissions were photos. It was so interesting to see the different perspectives people had while photographing the cakes. If you would like to see for yourself, the exhibit runs through January 17th. More information can be found on the Soulard Art Market website. 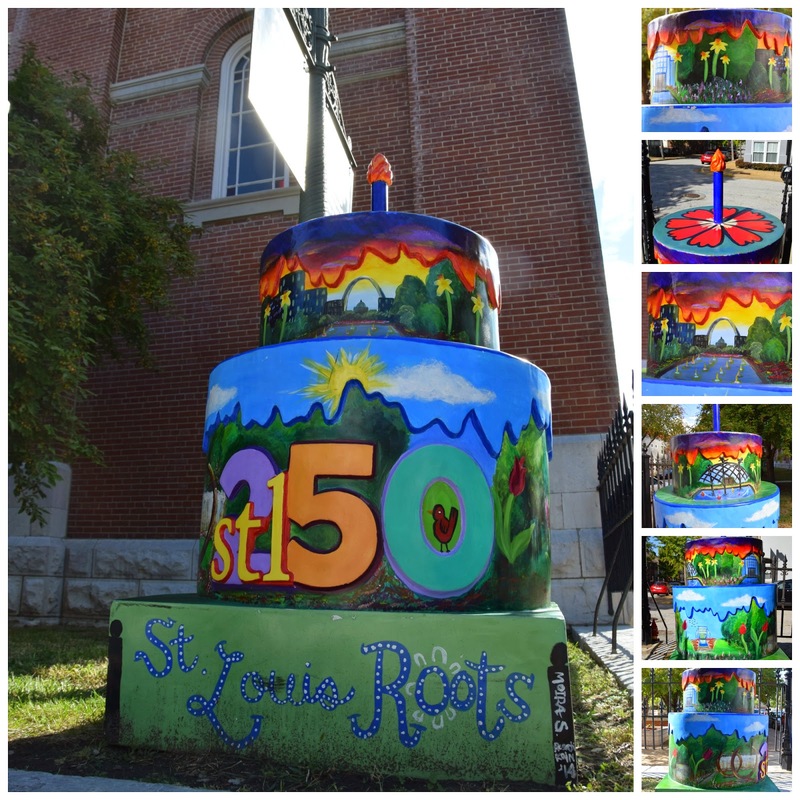 At the October meeting of the Webster Groves/Shrewsbury/Rock Hill Chamber of Commerce meeting, I was asked to talk about my experience of finding all 250+ cakes placed by the STL250 organization. 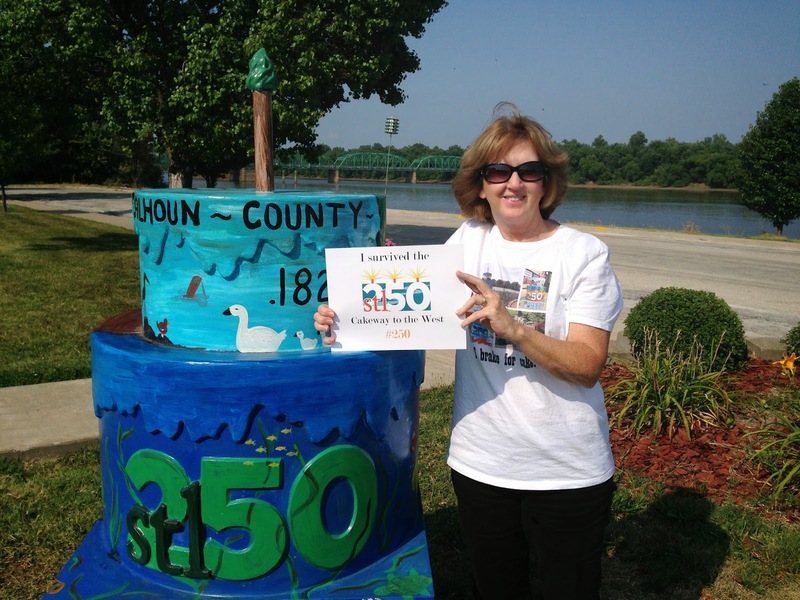 Joining me on the program was Erin Budde, formerly the Executive Director of STL250. After our presentations there was to be an unveiling of a rogue cake, meaning one that is not officially sanctioned by the organization. The cake was commissioned by the Webster Groves Historical Society to be placed in front of the historic Hawken House, built in 1857 and certainly much older than many official cake locations. I arrived early to the meeting as I was bringing the computer and projector for the presentations. I like to have extra time because technology is not always my friend. When I pulled into the parking lot, I saw the artist, Henryk Ptasiewicz but no cake. I have met him at a caker's picnic, so I went over to talk to him. He told me that he simply had run out of time and the cake was not complete. The unveiling had been all over social media, and a local reporter was coming to cover the story. We immediately got on Twitter and Facebook to let folks know that the cake was not in place. Despite that setback, the meeting went well. I ran a slide show of all of my cake photos (well, two of each cake anyway) in the background during the preliminary meet and greet and lunch. Erin was first on the program, and her talk was quite interesting as she filled us in on some of the behind the scenes activities that led to the formation of the volunteer STL250 group back in 2009. 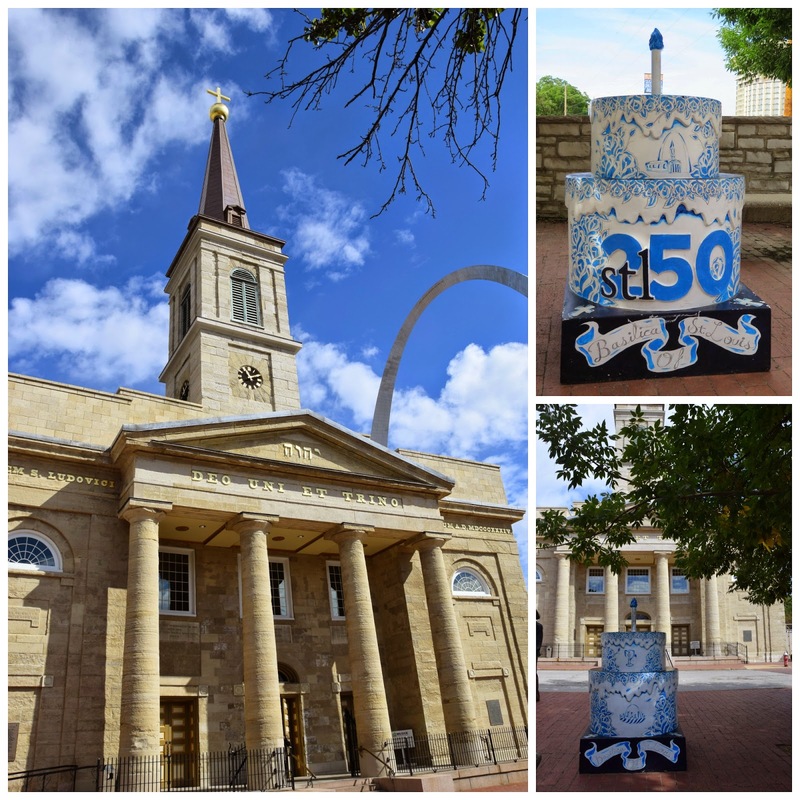 The very first cake to be placed was St. Louis City Hall in February of 2014. For my portion of the program I talked about what the cake hunt had meant to me, the things I learned about the metropolitan area, and the wonderful people I have become acquainted with along the way, including the 1,800 plus member Facebook group. To bring things back to the audience, as business owners in the area, I discussed the benefits of this caking adventure such as high visibility for the businesses and organizations lucky enough to have a cake. It also helped other businesses in the area as the cakers stopped for meals, drinks and shopping along the way. I really enjoyed the opportunity to share my experience of learning more about the history of the area. As it ended up, the Hawken House cake had a very quiet unveiling on the following Wednesday, and I took photos of it on Thursday morning. If I didn't know the cake was made out of wood and not fiberglass like the official cakes, I would have no idea that it was a rogue cake. It is that good! 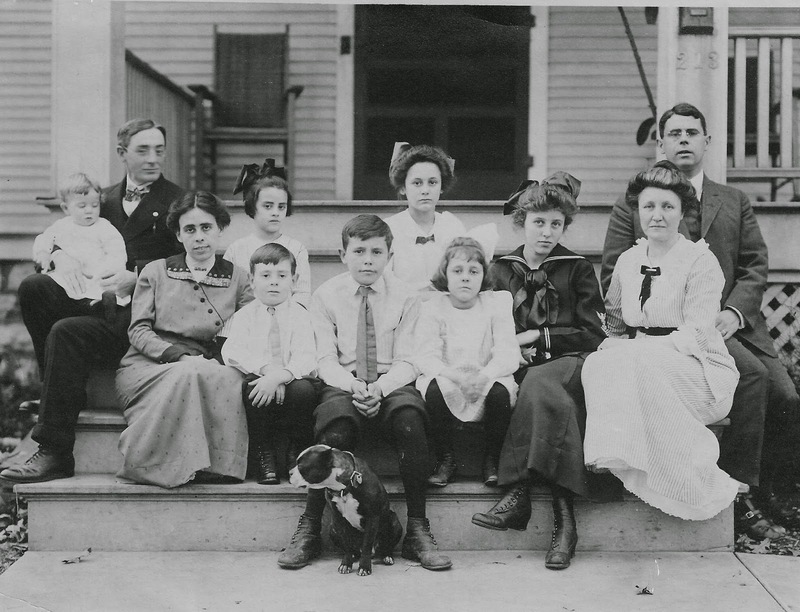 Recently my sister and I traveled to Cincinnati to visit with relatives. My mom has two sisters who are still living, and my dad has one sister who is still alive. We drove over on a Thursday, and stayed with our cousin and his wife, who graciously put us up (or perhaps I should say put up with us) whenever we come over if they are in town. They also know that our first meal when we hit town has to be Skyline Chili. On Friday a small group of us got together for lunch, and a couple more relatives joined us for dinner. Saturday morning one of my cousins picked me up to head to downtown Cincinnati. We began the morning at Holtman's Donut Shop, seen recently on Diners, Drive-Ins and Dives and Donut Wars. Gina insisted that the Maple Bacon Donut was going to "change my world". She pre-ordered several as that is one of the donuts that they regularly run out of in the morning. After a short wait in line, which passed quickly with the entertainment of watching the staff make donuts, I selected a half dozen donuts to take back to my hosts since they had never come to this donut shop before. After Gina got her order, we walked down the street to a coffee and wine bar (the donut shop has limited seating and NO hot tea!?!) to order drinks and enjoy a donut. Oh, my! I am not sure if my world was changed, but my tummy was really happy to start the day with this special donut. After walking and shopping we had worked up an appetite for lunch. (If it seems as if I eat my way through Cincinnati, that is probably because I do.) 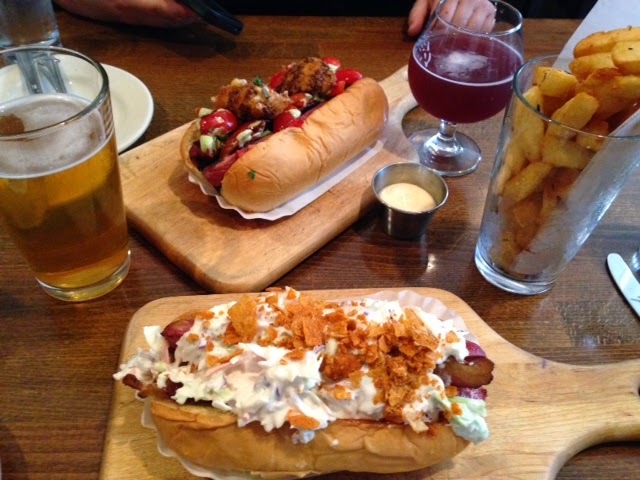 This time we chose Senate, purveyors of gourmet hot dogs, which also has made an appearance on Diners, Drive-ins and Dives. I ordered the Trailer Park and she got the special of the day, and we split them along with some fries. Everything was delicious! It was time to do more walking after feasting on the dogs and fries, so we walked around the area looking at the murals. 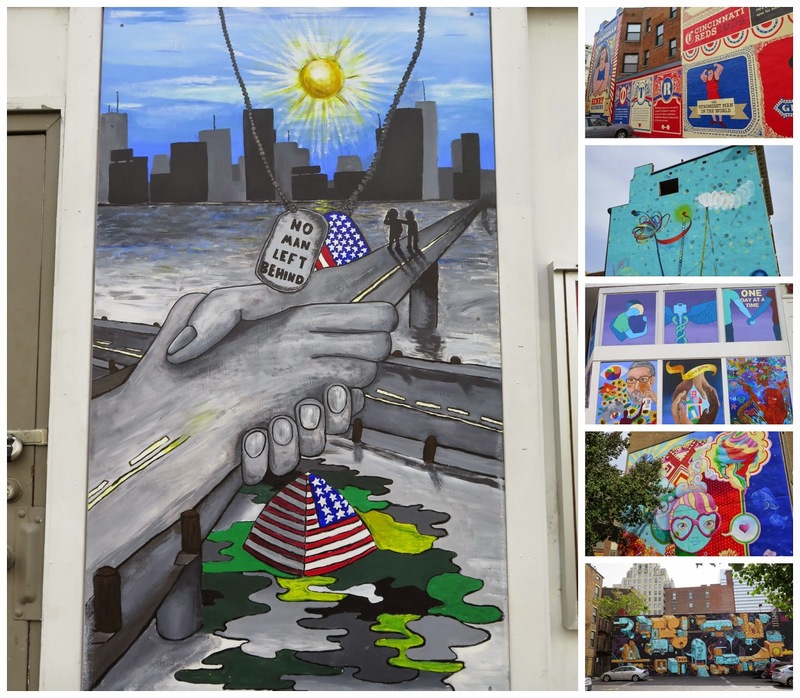 Part of a project dedicated to creating a mural in each of Cincinnati's 52 neighborhoods, there are now 90 murals that have been completed. We saw a small sampling of them, but I know what I would be doing if I lived in the area! From there we drove to Price Hill Chili (to eat more, of course!) where my Crusham relatives were gathering for a small reunion. We ended up with more than 40 people, which was a great turnout. We captured most of them in this photo. Sunday my sister and I met with Aunt Gloria, my dad's sister, and her 3 children at a restaurant in Newport, Kentucky. It has been several years since we had seen them, so it was nice to catch up. I was also able to fill them in on my trip to Switzerland last fall, where I met many Kubler relatives that we had not known about prior to my trip. Monday found us on the road back home, after a quick stop at Kroger to pick up Skyline Chili and goetta to tide us over until our next trip east. It was a great trip! Due to an illness on their end, we did not end up having company last weekend. Instead we had my sister and her husband over for dinner Saturday night. They had been invited over that day anyway, so we just ended up with a smaller dinner party. The weather was cool and crisp, and perfect for the chili and honey cornbread I had planned for the meal. It was nice to have some one on one time with them, as it has been awhile since the four of us have been together. Jim took off on a motorcycle ride Sunday morning, which left me with a day alone. Hmmm...what to do? 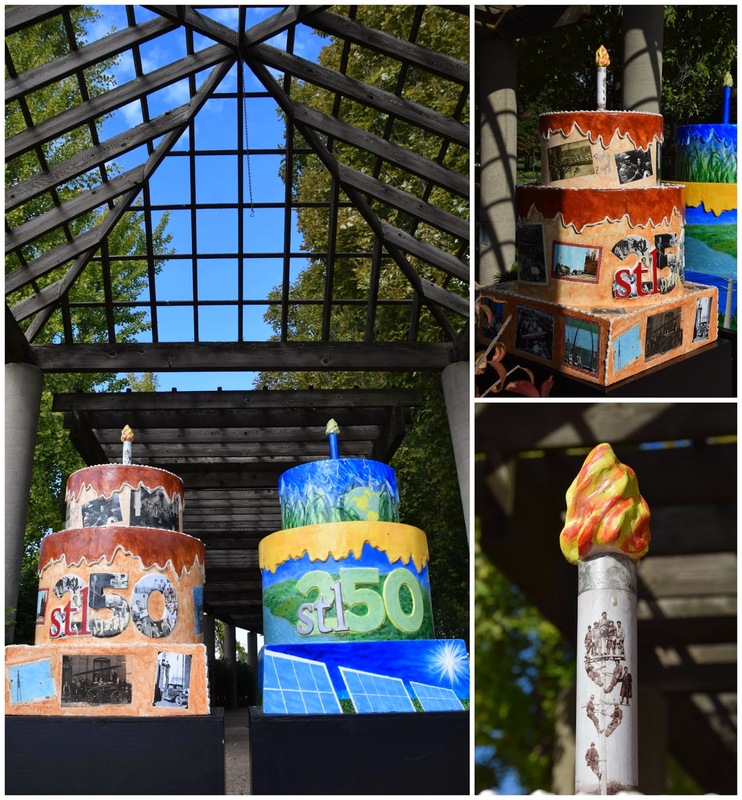 Rumor on the street was that the second Ameren cake, normally inside and available to employees and company guests only, was outside due to an event on Saturday. Early reports on the Cakeway to the West Facebook page Sunday morning indicated it was still out there. So I traded my workout clothes for jeans and a Cardinals sweatshirt, grabbed my camera and my garden gnome, and took off for Ameren. Sure enough, the cakes were there side by side, as well as a couple of other cakers. Since I was out anyway, I decided to take some new photos in the downtown area. When I originally went to the Shrine of St. Joseph, I didn't realize that even though the cake was behind a fence up on a stone wall, the gate can be opened to better photograph the cake. I also couldn't go into the church in June as there was a wedding taking place. I am so glad that I went back. 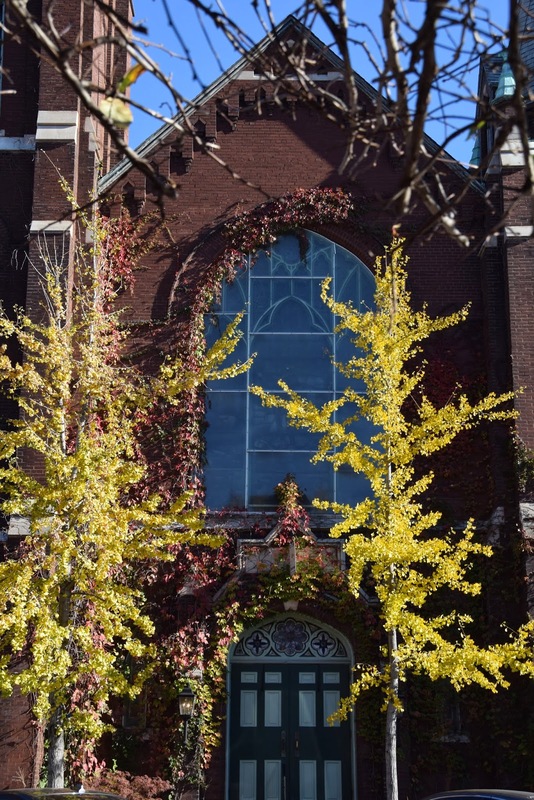 What a beautiful church! 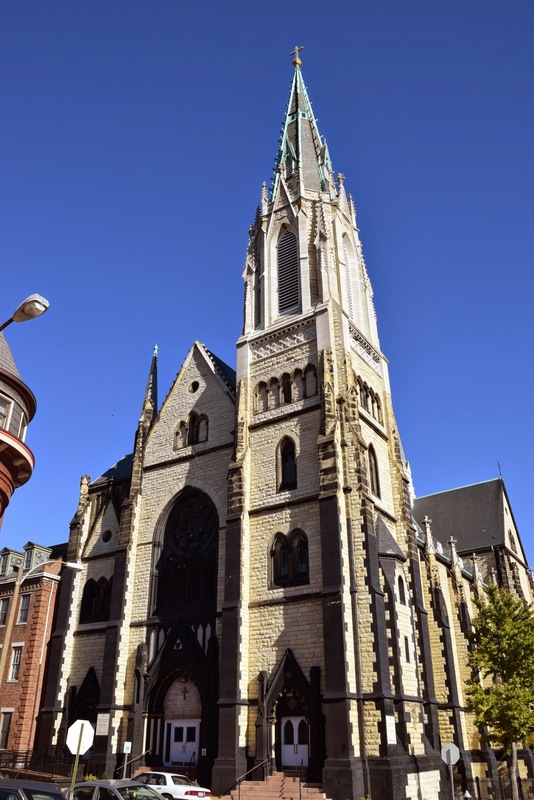 Located at 11th and Biddle Streets, this parish traces its roots back to 1843. 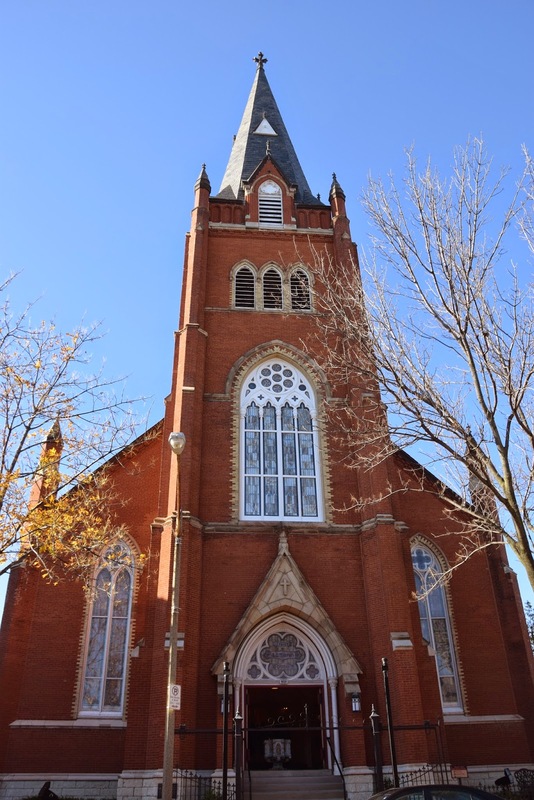 The cornerstone of the church was laid in 1844, and it was dedicated in 1846. And I absolutely love all of the St. Louis icons that appear on the cake. 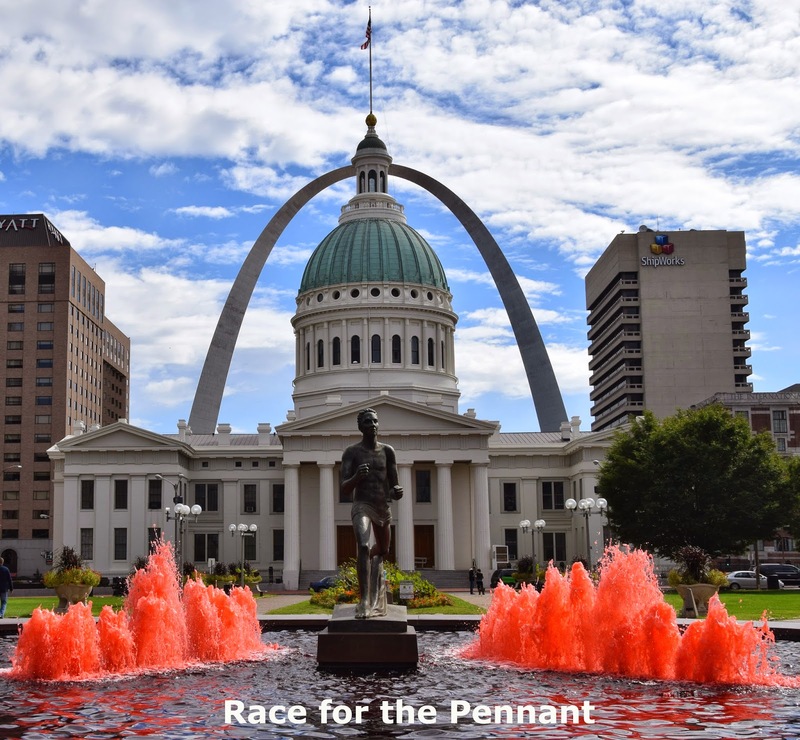 Next I went to Citygarden as that cake had been moved to a new location, and then over to Kiener Plaza where I was certain the fountain would be splashing red for the Cardinals playoff game. I was not disappointed! I picked up a few shots of the Hilton and Drury Hotels for frame of reference shots for my cake book before walking down to the Old Cathedral. It had been draped in scaffolding when I photographed the cake back in June. It looks very pretty now. 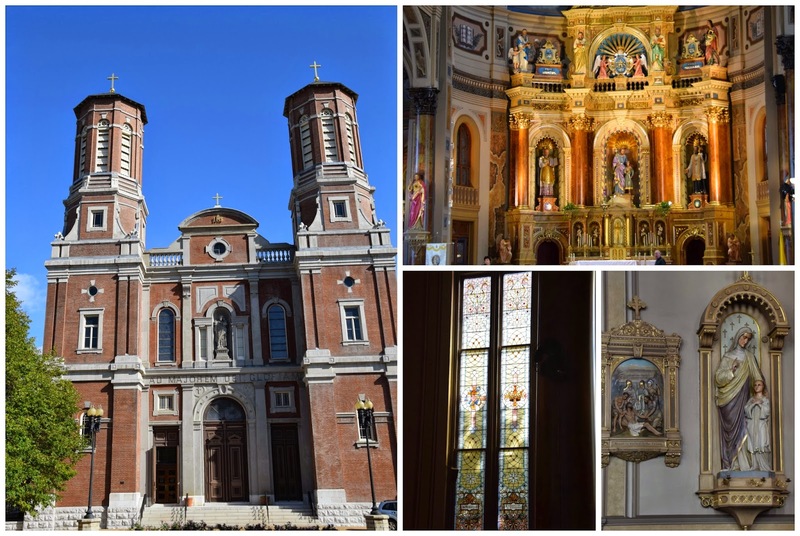 I took a peak inside, but Mass was just wrapping up so I didn't take any pictures of the interior. This final photo pretty much sums up how it felt to be exploring downtown St. Louis with my camera on a beautiful fall day. Only one last thing to say - Let's go Cards!